Article I, Section 8 of the U.S. Constitution states: “The Congress shall have the Power…To Coin Money.” From that statement came the United States Mint, the government body responsible for producing official U.S. coinage. But how exactly did the Mint come about? Who established it? What specifically does it do, and where? Read on to find out. The creators of the U.S. Constitution recognized the need for an official monetary system. Before the establishment of the Mint, early Americans traded goods and services using foreign currency. Just a few years after the final ratification of the Constitution, Secretary of the Treasury Alexander Hamilton began preparing plans for a national Mint. 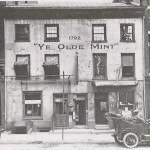 On April 2, 1792, Congress passed the Coinage Act, which established the Mint and authorized construction of the first Mint building in Philadelphia, the nation’s capitol at the time. It was the first federal building erected by the U.S. government under the Constitution, known as the “Ye Olde Mint”. The Coinage Act originally authorized the Mint to coin gold Eagles, Half Eagles, and Quarter Eagles; silver dollars, half dollars, quarter dollars, dimes, and half dimes; and copper cents and half cents. President George Washington appointed renowned American scientist David Rittenhouse as the first Director of the United States Mint. Rittenhouse served from 1792 to 1795. Under his term, the Mint produced and delivered its first circulating coins in March 1793, consisting of 11,178 copper cents. Thomas Jefferson and Benjamin Franklin were included in the research and development of early versions of the coins. The Mint began issuing gold and silver coins next. President Washington lived only a few blocks from the Philadelphia Mint building, and legend has it that he donated some of his own personal silver reserves for the minting. On March 3, 1835, Congressional legislation established additional Mint branches in three different cities: New Orleans, Louisiana; Charlotte, North Carolina; and Dahlonega, Georgia. The Charlotte and Dahlonega Mints were established to meet the need to use local gold deposits for coinage, and they minted only gold coins. Circumstances of the American Civil War, which began in 1861, closed both Mints permanently. The New Orleans Mint also closed as a result of the Civil War, but reopened at the end of Reconstruction in 1879. The New Orleans Mint produced silver three-cent pieces, dimes, half dimes, quarters, and half dollars; and gold dollars, Eagles, Half Eagles, Quarter Eagles, and Double Eagles. In 1870, to take advantage of local silver deposits, a new branch was opened in Carson City, Nevada and operated until 1893. Gold coins were also produced there. A branch in The Dalles, Oregon was commissioned in 1864 but never completed. Currently there are four active Mint branches: Philadelphia, Denver, San Francisco, and West Point. 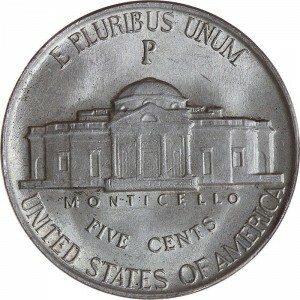 Prior to 1909, coins minted by the U.S. government featured a mint mark, a letter indicating the Mint branch where the coin was produced. The system was fairly self-explanatory: Philadelphia= P, Charlotte = C, New Orleans = O, Dahlonega = D, Carson City = CC, etc. The status of mint mark usage on U.S. coins has changed several times throughout history. Numismatists often use the presence or absence of a mint mark on a coin as a marker of value. 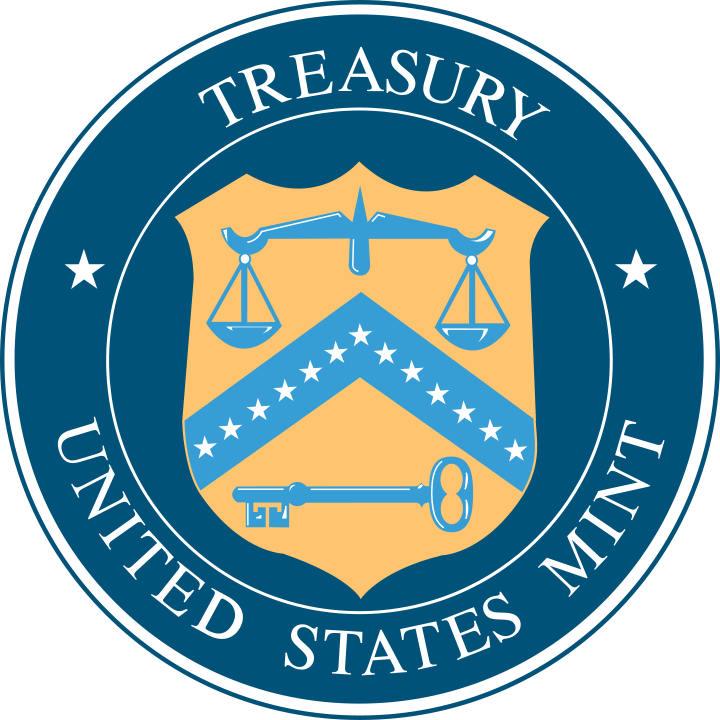 Contrary to popular belief, the Mint is not responsible for producing paper currency – that responsibility belongs to the Bureau of Engraving and Printing, under the Treasury Department. For an idea of how much coinage is produced each year, in 2000 the Mint produced 28 billion coins. The first Philadelphia Mint used harnessed horses to drive the coinage machinery. A two-cent coin was minted from 1864 to 1873. It was the first coin to feature the motto “In God We Trust”. Thomas Jefferson first proposed the decimal currency system, which is still used today. In 1943, the metal content of cent coins was changed to zinc-coated steel due to a copper shortage during WWII. Sacagawea, Susan B. Anthony, and Helen Keller are the only women depicted on a circulating coin. Sacagawea appeared on the obverse of the golden dollar, Susan B. Anthony appeared on the obverse of the dollar coin, and Helen Keller appeared on the reverse of the Alabama quarter. Calvin Coolidge was the first President to have his portrait on a coin that was struck while he was still alive. All commemorative coins produced by the U.S. Mint are legal tender. Original gold coinage included $10, $5, and $2.50 denominations. The Lincoln cent is the only coin in circulation in which the portrait faces to the right. The coin designer’s initials can be found on each circulating coin. The San Francisco Mint, established in 1854, survived the great San Francisco Earthquake of April 18, 1906. Before creation of a national Mint, “currency” included foreign and colonial currency, livestock, produce, and wampum (Native American shell beads). American Bullion is a trusted leader in adding precious metals to your Individual Retirement Account (IRA). We specialize in converting your existing IRA or former 401(k) to a Gold IRA holding physical gold or other precious metals. We also provide investors with a wide variety of physical precious metal products delivered safely and securely to their doors. American Bullion carries all U.S. and European pre-1933 coins, as well as modern gold and silver bullion in the full spectrum of currently available coin and bar products. For more information, call 1-800-326-9598 to speak with one of our knowledgeable precious metals specialists.